Baylor recovered after blowing a 17-point lead and losing a star player, beating Notre Dame 82-81 for the NCAA women's basketball championship Sunday night. 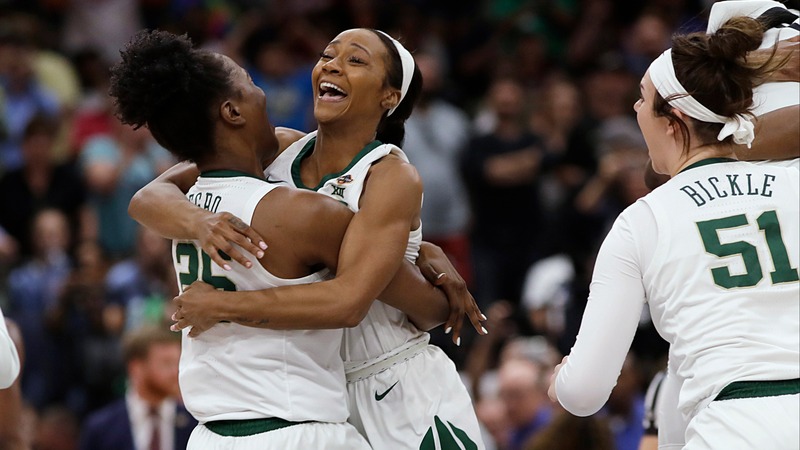 TAMPA, Fla. (AP) — Baylor recovered after blowing a 17-point lead and losing a star player, beating Notre Dame 82-81 for the NCAA women's basketball championship Sunday night when 2018 tournament hero Arike Ogunbowale missed a foul shot in the final seconds. Chloe Jackson made a layup to put Baylor ahead with 3.9 seconds left. Notre Dame called timeout and inbounded to Ogunbowale, whose buzzer-beating jumper in the championship game lifted Notre Dame to last year's title. Ogunbowale was fouled trying for a layup, then missed the first of two free throws with 1.9 seconds remaining. She made the second, but the Irish never got the ball back. Notre Dame's one-point loss was good enough to [cover the 2.5-point spread](https://www.betchicago.com/womens-basketball-championship-odds-baylor-notre-dame-rematch). The Lady Bears (37-1) won their first championship in seven years. Coach Kim Mulkey and Baylor have won titles in 2005, 2012 and 2019. The 2012 championship game also pitted the Lady Bears against Muffet McGraw's Irish in the last meeting of two female coaches for the title. Baylor was able to pull off the win without star forward Lauren Cox, who injured her knee late in the third quarter. The Irish were able to rally from a 14-point deficit in the third quarter to tie it at 78 in the fourth. Jackson then scored a jumper from the foul line, and Jessica Shepard countered with two free throws to tie it, setting up the exciting finish. The Lady Bears were primed to run away with the game as Notre Dame struggled to score. But the Irish have a knack for big comebacks, doing it against UConn in this year's semifinal and against Mississippi State in last year's title game, when they rallied from 15 down in the third quarter. Ogunbowale led the charge again, scoring 17 of her 31 points in the second half. That included a buzzer-beating 3 at the end of the third quarter, sparking an 11-0 Notre Dame run. It helped the Irish that the Lady Bears had to play the last 11 minutes without Cox. She got tangled up with Kalani Brown on the defensive end and went down clutching her left knee with about a minute to go in the third quarter. The 6-foot-4 junior was crying in agony for a few minutes before they took her off the court in a wheelchair. Her mom was tearing up in the stands, and her dad had his hands over his face. She came back to the bench in the fourth quarter on crutches, with a big brace on her left knee. She was the first one to hold the trophy after the game. Mulkey was able to celebrate her third title with her family close by. Daughter Makenzie is on the coaching staff, and infant grandson Kannon Reid was sitting in the front row behind the bench. As the final second ticked off, she hugged her daughter and the rest of the staff at midcourt. Jackson was named the Final Four's Most Outstanding Player. With the game tied at 80, she drove with her right hand and hit a layup that bounced off the rim before dropping in.